TORRANCE, Calif., April 17, 2019 /PRNewswire/ -- In front of a packed studio audience consisting of top HBCU students, school presidents, HCASC alumni and Honda associates, Spelman College took home the championship title and a $75,000 institutional grant at the 30th annual Honda Campus All-Star Challenge (HCASC) National Championship Tournament, America's premier academic competition for HBCUs. Hosted on the Honda campus in Torrance, California, HCASC is the only program of its kind and provides a national stage for high-achieving HBCU students to advance their dreams. Each year, Honda awards more than $350,000 in institutional grants to participating HBCUs in addition to providing travel, meals and accommodations for the 48 teams. 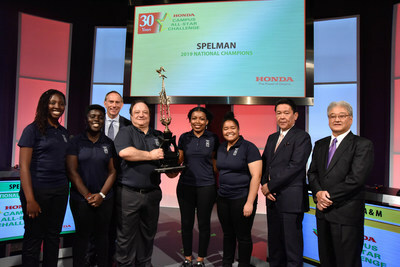 Honda executives congratulate Spelman College for winning the 30th annual Honda Campus All-Star Challenge (HCASC), the school's first-ever HCASC championship. More than 300 Historically Black College and University students, coaches, presidents and institutional representatives participated in and attended the 2019 Honda Campus All-Star Challenge National Championship Tournament in Los Angeles. In a two game sweep against Florida A&M University, the Spelman team demonstrated superior academic prowess, gameplay and teamwork by accurately answering questions about history, science, literature, religion, the arts and pop culture. Spelman bested teams from 47 HBCUs and qualified for the National Championship Tournament after winning a series of regional competitions throughout the academic year. The winning team was coached by Daniel Bascelli and includes Jessika Agyepong, Maati McKinney, Naomi Steplight, and team captain, Ariana Benson. "Winning itself isn't the only reward. It's about bringing these students together and watching them represent their school in the best possible way," said Daniel Bascelli, coach, Spelman College. "The spirit at Spelman is really strong. If you talk to the students, the feeling for Spelman, the feeling for HCBCUs and the support that Honda gives them is all a part of the pride that they feel." Runner-up Florida A&M University was awarded a $30,000 grant, while the third and fourth place finishers – Jackson State University and Morehouse College – received $20,000 each. This year's HCASC theme was "30 Years of Advancing Dreams." In 1989, Honda established Honda Campus All-Star Challenge to recognize and celebrate the academic talents of HBCU students as well as to provide personal development and experiential learning opportunities. Participants gain life-changing experiences through travel, community involvement, networking opportunities with business leaders and making friends for life. "Honda is proud to commemorate the 30th annual Honda Campus All-Star Challenge and continue shining a spotlight on HBCU students' academic talents," said Steve Morikawa, vice president of Corporate Relations and Social Responsibility at American Honda. "Through HCASC, students are given an opportunity to demonstrate the value of their HBCU experience, represent their schools on a national stage, and connect with like-minded peers. We look forward to celebrating the HCASC legacy and the friendships we've made over the past 30 years." Every year, dedicated volunteers, coaches and alumni help to make the Honda Campus All-Star Challenge a success. Honda recognized outstanding individuals who have made an impact during this year's competition, naming Daniel Bascelli, 17-year HCASC coach of Spelman College, Coach of the Year. Fellow HCASC competitors selected Ariana Benson of Spelman College to receive this year's Ernest C. Jones Sportsperson Award. Named for one of HCASC's early volunteers who mentored students, the award recognizes a student who epitomizes team spirit, camaraderie, good sportsmanship and academic focus during the National Championship Tournament. In addition to celebrating the HCASC scholars, Honda also honored an individual who has dedicated his or her life to service in the community with the fifth-annual HBCU Power of Dreams Award. This year's recipient is Chuck Hobbs of Tallahassee, Florida. Hobbs is a Honda Campus All-Star Challenge alumnus and volunteer. He has mentored thousands of young people over the past three decades, including students at Florida A&M University (FAMU), FAMU Developmental Research School and Morehouse College. He is active on social media, promoting HBCUs and the unique role they play in the African American community. A video about Hobbs' positive impact can be seen at https://honda.us/HBCUAward2019. "Chuck embodies the Power of Dreams and encourages young people to realize the power of their own dreams, so it's very fitting that we honor him with this award," said Morikawa. Honda presented Hobbs with a surprise grant to help him continue his mission and positive impact in the HBCU community. More than 150,000 scholars have participated in HCASC since 1989. Building a legacy of greatness, HCASC alumni have gone on to become engineers, lawyers, doctors and professors. Across 21 states, there are 87 HCASC-eligible HBCUs in the U.S.
To prepare for the competition, students spend hundreds of hours studying science, history, art, current events, math, African American history, geography, literature, sports, and pop culture. Since HCASC was established, Honda has awarded more than $9 million in grants to participating HBCUs, which have been used to fund tuition and book scholarships, student development initiatives, endowment and development campaigns, as well as facilities and equipment. 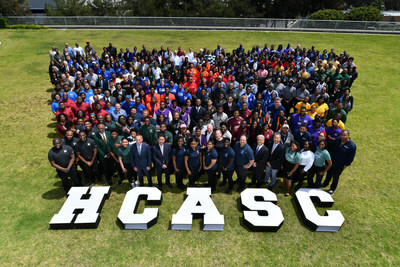 More than 300 HBCU students, coaches, presidents and institutional representatives participated in and attended the 2019 Honda Campus All-Star Challenge National Championship Tournament in Los Angeles. 125 volunteers, including Honda associates, helped produce the 2019 National Championship Tournament, hosting the students, conducting registration and serving as game officials. For photos, videos and additional information about the 2019 Honda Campus All-Star Challenge, including a full list of the 48 qualifying teams, visit HCASC.com. Connect with HCASC on Facebook, Twitter and Instagram and follow the conversation using #HCASC. Honda has supported and celebrated America's HBCUs for more than 30 years. Since 1989, Honda Campus All‐Star Challenge (HCASC), one of Honda's largest and longest running philanthropic initiatives in the United States, has impacted the lives of academic superstars from across the country. Since 2003, Honda Battle of the Bands (HBOB) has provided eight top HBCU marching bands with a once‐in‐a‐lifetime opportunity to deliver a dynamic performance on a national stage. Both HCASC and HBOB enable HBCUs to earn grants and receive positive attention for their respective institutions. Through programs like HCASC and HBOB, Honda has been able to touch the lives of more than 170,000 students and award $12 million in grants in support of education programs.